Fun Hot Air Balloon DIY Graduation Card Holder Box – a unique centerpiece for your gift table! Transform your boring graduation card holder box into a hot air balloon that will be the focal point of the gift table at your grad party or open house. Keep reading to learn how easy it is to make a hot air balloon DIY graduation card holder box! Two high school grad parties down and two to go! More than anything, I want to preserve these graduation party projects here so when my middle daughter graduates in two years, I don’t have to reinvent the wheel when it comes to grad party decoration ideas. Anyway, today I want to share with you how to make a graduation card box look like a hot air balloon. This was the centerpiece I made for the gift table at my oldest daughter’s grad party. I fell in love with these hot air balloons card boxes at our local party store when I first saw them several years ago. Although they were being showcased as an idea for weddings, I knew immediately that I wanted a hot air balloon card box for my daughter’s graduation open house. For this DIY graduation card holder box, I decorated a plain white card box to look like a balloon basket, complete with woven paper strips. Then I added cloud die cuts and photos of my daughter. The card box was attached to a 3 foot balloon with a net – giving the appearance of a hot air balloon. It was the hit of the party and I got so many comments about how much everyone loved it. Want to learn how to make a graduation card box look like a hot air balloon? I have complete instructions for you below. No time to read this graduation card holder tutorial now? Pin the tutorial to a grad party ideas board for later reference! Start by taking a piece of 12″ x 12″ brown textured cardstock and cut it into 1 inch strips. With the framework completed for the DIY graduation card holder box , start weaving strips in and out down the length of the vertical strips, going all the way to the bottom. I used my Hermafix adhesive squares dispenser to stick everything down, but you can make a graduation card box holder with whatever strong scrapbooking adhesive you might have on hand. You will need to make 4 of these woven sheets in all. Use a hot glue gun to attach the woven pieces to the sides of the plain card box. To give a more finished look to the hot air balloon card box, cut 4 more 1″ strips from the brown cardstock. Fold each strip in half lengthwise, and use a glue gun to affix them to the vertical edges of the card box. While the woven strips alone make a graduation card box holder look like a hot air balloon basket, you can make it extra special by adding some 5″x 7″ photos of your child and cloud die cuts. You will want to use a glue gun to adhere all the decorations to the card box because regular scrapbooking adhesive will not work on the texture of the woven paper strips. Mat 4 pictures of your child on black cardstock, leaving a 1/4″ border on all sides of the photo. Adhere 1 photo to the center of each of the sides of the graduation card box. Die cut letters spelling out “The Sky’s the limit” and “Time for you to soar” from white cardstock. You will also need 16 white cloud die cuts in assorted sizes. I used my Cricut Electronic Die Cutting Machine to make the die cuts to decorate the DIY graduation card box. I used the cloud shape from the Everyday Paper Doll Cricut cartridge. The Extreme Fonts cartridge is a good choice for making the titles. That way you have a variety of options for the look of the titles. 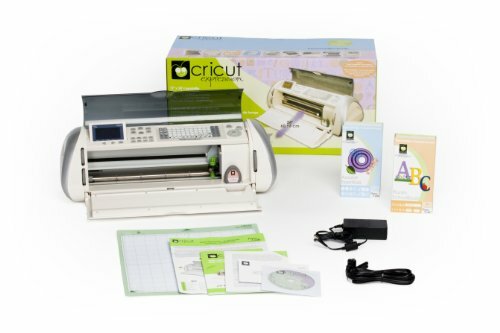 If you have another brand of electronic die cutting machine, you just need cutting files for a script font and a cloud shape. Adhere the die cut letters above the photos and adhere the clouds at the bottom of the photos. You want it to look like your hot air balloon card box is up in the clouds! I used 4 different photos of my daughter and alternated between “The Sky’s the limit” and “Time for You to Soar”. Cut down a piece of black and white patterned paper to 11″ by 11″ and adhere it to the top of the box. Use an Exacto knife to cut out the slit where people can insert their graduation cards. Cut out letters spelling “Congrats” in the school colors and adhere that to the top. 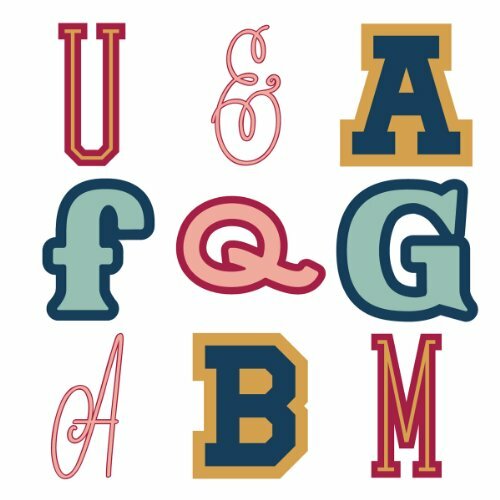 I layered black and orange letters (my daughter’s school colors) on top of each other to give a shadow effect. Optionally, you can also add a grad cap and diploma die cut to the top of this DIY graduation card box. The die cuts I used were cut with the Cricut Recess Cricut Cartridge. 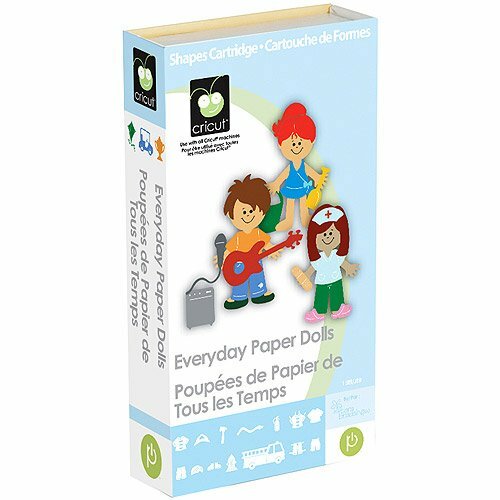 Use a hole punch to punch holes in each of the corners of the card box. This is where you will attach the ribbons that hold the net to the card box. Blow up the 3 foot balloon with helium. ✅ TIP: You can buy a small disposable helium tank if you have lots of other balloons to fill for your grad party. 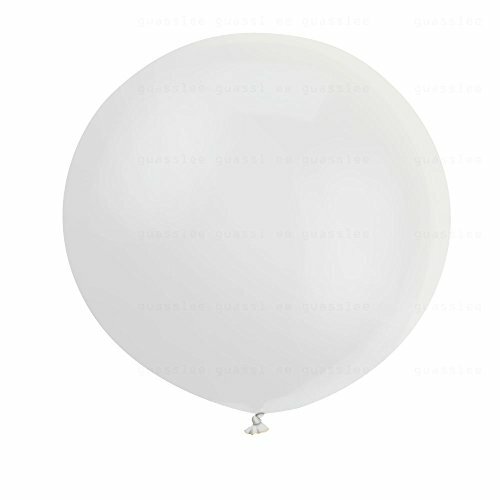 Or if you don’t think you will use the entire helium tank filling balloons for your grad party, you can also take the giant balloon to a party store. For a small fee, most party supply stores will fill the balloon with helium for you. After the balloon is filled with helium, put the net over it. The balloon will float away if you let go of it, so it might be helpful to have someone holding it down for you while you cut the ribbon and attach the hot air balloon net to the box. Cut (16) 6 foot lengths of curling ribbon (in the school colors). Tie one end of each ribbon to a corner hole on the card box. Tie the other end to the net, leaving a long tail. Use scissors to curl the ribbon tail. Repeat for the remaining ribbons. You want 4 ribbons coming from each corner and each ribbon should be tied to a different spot on the net. You want ribbons all the way around the balloon holding the net securely over the balloon so there is no way the balloon could slip out. ✅ Please note: The assembled hot air balloon card box is HUGE! We could not fit it in our regular car. We had to use our van to move it to the grad party location. 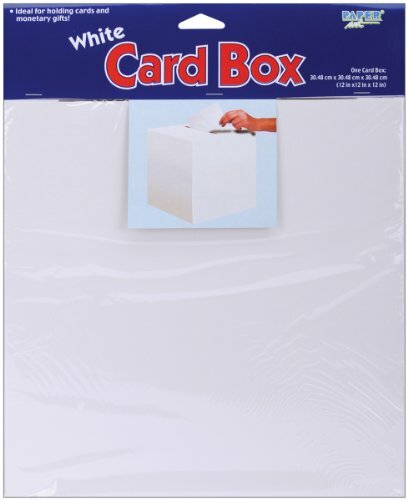 If you don’t have a van or SUV, I would recommend that you finish assembling the graduation card box at the party location. And that’s all there is to it! It was so simple to make a graduation card box holder look like a hot air balloon and everyone at my daughter’s grad party was talking about how creative it was. I just love how it turned out! No time to make this graduation card holder now? Pin the tutorial to a grad party ideas board for later reference! Although I made mine into a graduation gift card holder box, you could easily use the same technique to make hot air balloon centerpieces for all your tables. 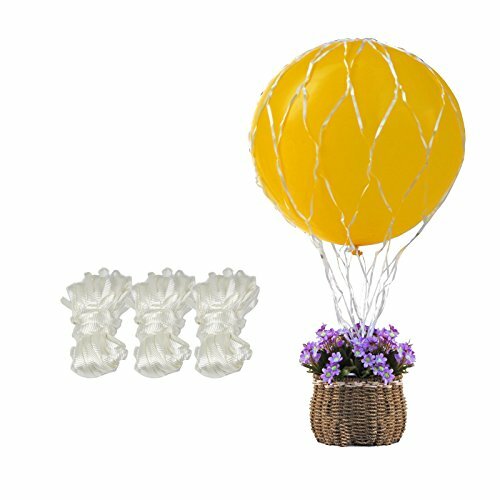 Instead of the card box as the basket, have the hot air balloon tethered to a pretty pot of flowers that match the school colors. These would look just gorgeous on each table that you have set up as a place for guests to sit and visit. For each DIY hot air balloon centerpiece, you would want to use a smaller balloon (16″ or 18″ in size) and a smaller hot air balloon net than you used for the card box. You will want to find a flower arrangement with a pot that has a 6″ or so diameter. I have two more daughters graduating within the next 4 years so I am planning to make hot air balloon centerpieces in addition to the hot air balloon card box for the gift table. If this tutorial for how to make a graduation card box look like a hot air balloon looks like something that would be helpful for a future grad party, be sure to pin the photo above so you can refer back to it later. I hope this hot air balloon card box tutorial has inspired you to do some crafting for an upcoming grad party or open house. For more ideas like this one, be sure to check out the rest of my graduation crafts. Happy crafting!